If you don’t want to be burdened with maintenance costs or rental vacancies, you can invest in mortgage notes in your self-directed IRA. You can also be a real estate lender with your IRA funds and help others purchase new properties. You set the terms of the loan, including time frames and interest rates. The payments will go to your retirement account. Secured notes, deeds of trust, and mortgage notes are basically the same thing, depending on the state that you reside in. Unsecured notes are not backed by collateral and thus often pose a higher risk than a secured note. Because of this increased risk, unsecured notes are generally structured at a higher interest rate. If you are issuing a new note or seller carry back note, simply submit a copy of the original note, deed of trust or mortgage, and a copy of the lender’s title report. If you are buying an existing note, you will need to submit a copy of the original note, recorded deed of trust or mortgage, title policy, deed of trust or mortgage assignment, note endorsement, and note purchase agreement, if applicable. If a borrower cannot pay the balance on a note, the property can be sold to satisfy the debt. Trust deeds, deeds of trust, and mortgage notes are basically the same thing, depending on the state that you reside in. In a trust deed, the investor loans money to a borrower using real estate as collateral. The loan is secured with a Trust Deed, which is recorded in county land records against the collateral. The terms of the loan are detailed in the Promissory Note. You will want to define the type of real estate you feel comfortable lending against. Working with a local real estate broker who specializes in trust deed investments is a good start. Perform your due diligence by asking for references, requesting a schedule of loans that have funded, and confirm the status of the broker’s license. It is advisable to order a third-party appraisal or valuation of the property you intend to invest in. You will want to verify that the value of the collateral is sufficient to return the principal on your loan. Additionally, obtain a Title Policy from a reputable title insurer that insures your trust deed on the property. Lastly, verify that the borrower has property insurance on the property and request verification that it names you as a "Mortgagee.” Seek legal and financial advice from trusted representatives. What are Unsecured Secured Notes (Promissory Notes)? A promissory note is a legal agreement between a buyer and a lender. The note contains the promise to repay a loan, along with the terms for the repayment. The note is not recorded in county land records. The lender holds the promissory note. When the note is paid off, the note is marked paid in full and returned to the borrower. How do I invest with Mortgage Notes? 1. Open and fund your Entrust self-directed IRA. 2. Find an individual or entity interested in borrowing money from your IRA. The loan must be secured by real estate. Issuing new note or seller carry back note. If you are partnering your IRA with personal funds, both you and your IRA are the lenders. In this case, you need to add the percentages of ownership interest to title. For example, The Entrust Group, Inc. FBO John Smith Account #12345, [Percentage of ownership] % undivided interest. 4. When you have submitted the required documents, Entrust will process the investment and remit funds to the borrower or to the entity responsible for closing the transaction. Normal processing takes approximately three business days with funding happening on the fourth business day, unless corrections are required. A special handling fee applies to expedited processing requests. 5. Assignment of Deed of Trust: The Deed of Trust or mortgage is owned by your self-directed IRA. 6. Send all documents related to the promissory notes to The Entrust Group for recordkeeping. Entrust must receive all documents signed by all parties for IRS audit purposes. Entrust must sign investment documents on behalf of your IRA. You will note “read and approved” with your signature and date each page of the investment documents. If the borrower is an entity, Entrust must see the entity formation documents to verify that the transaction is not prohibited under IRC 4975. After the investment is completed, all payments made according to the terms of the note must be submitted to Entrust using a Deposit Coupon form. For specific account questions, please contact an Entrust representative. 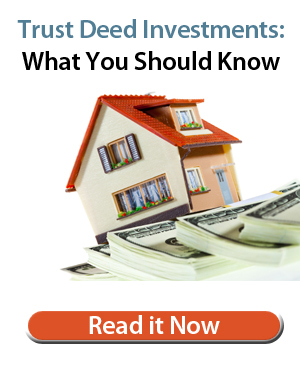 Learn about Trust Deeds in this report from the California Bureau of Real Estate!